Hikone’s nationally famous official mascot, Hiko-nyan (ひこにゃん, officially misspelled as Hikonyan) appears three times every day at Hikone Castle. Each appearance lasts 30 min. See the appearance schedule below. Hiko-nyan is a white cat wearing a red samurai helmet with horns. “Hiko” refers to Hikone, and “nyan” is a baby word for cat. The red helmet is modeled after the one worn by Lord Ii Naomasa, the first lord of Hikone Castle. 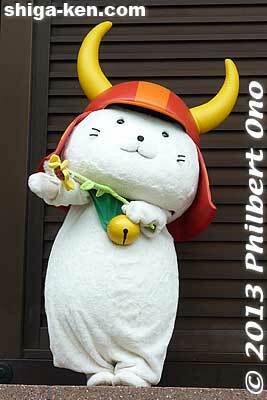 Hiko-nyan was originally the official mascot for Hikone Castle’s 400th anniversary in 2007. He proved to be so popular that he was retained as the city’s official mascot indefinitely. Hiko-nyan’s official birthday is April 13, 2006 when the name “Hiko-nyan” was decided. They celebrate his birthday at the castle. Hiko-nyan in front of the castle tower. 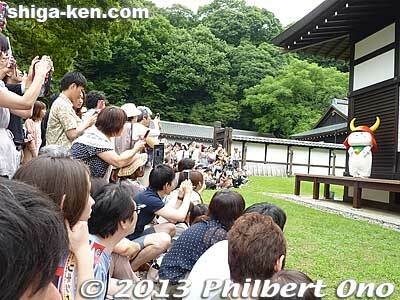 Hiko-nyan performing at Hikone Castle Museum. In the beginning, the city allowed businesses to sell Hiko-nyan merchandise royalty-free to help spread word about the castle’s annniversary. But not anymore. The city now takes a cut on sales of authorized Hiko-nyan goods. 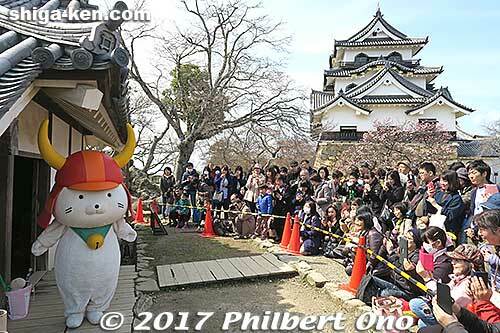 Hiko-nyan’s unexpected and explosive popularity prompted the artist who created Hiko-nyan for Hikone to file suit against the city over Hiko-nyan’s copyright and trademark rights (details here) after the castle’s year-long anniversary celebration ended. What the artist was paid to create the character suddenly seemed paltry compared to the enormous merchandising sales the mascot was generating. The dispute has recently been resolved, finally. Hiko-nyan has traveled widely around Japan and even ventured overseas like to Hawaii (photos here) to promote Hikone. In July 2013, Hiko-nyan traveled to Paris, France to attend the Japan Expo. Apparently there are at least two Hiko-nyan suits since he can be at two places at the same time. While Hiko-nyan was in Paris, Hiko-nyan was still scheduled to appear at Hikone Castle. 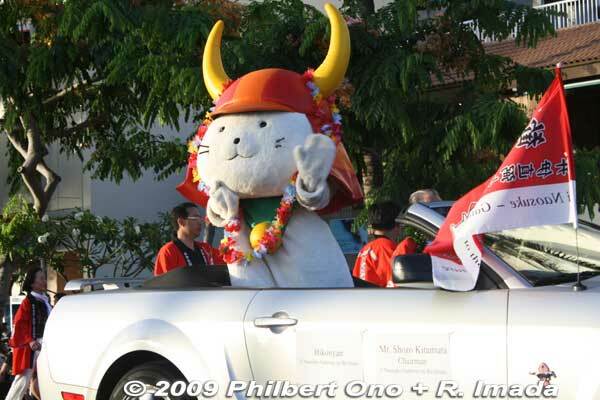 Hiko-nyan, wearing a lei, parading in Honolulu, Hawaii. Hiko-nyan sparked the boom in mascot characters in Japan. Cities, towns, companies, and organizations right and left in Japan have developed their own mascots, but very few have gained national prominence like Hiko-nyan. Hiko-nyan received over 10,000 New Year’s postcards this past New Year’s Day. (City hall employees vowed to answer each one.) Not to mention a big pile of chocolates on Valentine’s Day. Hiko-nyan is based on a real or perhaps legendary cat. According to one legend, one day, Ii Naotaka, the third lord of Hikone Castle, was practicing falconry in Tokyo and was near Gotokuji temple when he saw this cat raising its paw. The cat beckoned him to enter the temple where he was able to rest inside. A major thunderstorm ensued, and the cat saved him from getting wet. Another legend says that as soon as the cat beckoned Naotaka into the temple, lightning struck the tree where he was standing. Thus, the cat saved his life. This legendary cat connection gave birth to the idea behind Hiko-nyan. This same legend is also one theory as to how the ubiquitous beckoning cat (maneki-neko) you see at shops and restaurants in Japan originated. The beckoning cat can be called Hiko-nyan’s cousin. Most people are spelling the name in English as, “Hikonyan” which I think is a mistake since people might mispronounce it as “Hikon-yan” (ひこんやん).